Premium Compatible Label Tapes for the Brother P-Touch H105 printer. Brother P-Touch H105 is a label printing machine suitable for both household and professional needs. The printer features a compact design and comes in a white color. 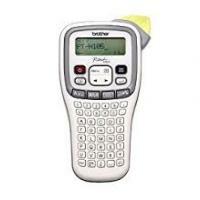 Brother P-Touch H105 comes with 6AAA batteries, laminated label cassette (4m) and a user guide. The printer can also be powered with an adapter. As this printer uses Brother P-Touch H105 Labeling Tapes, therefore running costs are quite low. Brother P-Touch H105 weighs around 390 grams and prints 3.5, 6, 9 & 12mm labels. Brother P-Touch H105 Label Tapes comes out in laminated form and tested positively for temperature, water, chemical and fade resistance. The print resolution is 180 dpi and maximum printing speed is 20mm / sec. There are total 54 keys on ‘ABC’ keyboard, one font, nine character style, 3 character size (large, medium, small), 178 symbols and seven frames and 20 language option. There are symbols and pictograph options like electric, caution, no smoking, warning, sports, cable labelling etc. Design can be interchanged from white text on black background or black text on white background with borders or underlines. The built in cutter cuts easily the label prints. There is a preview option before printing the label. There is a label memory which stores 9 of the favorite label. Brother P-Touch H105 label printing machine is suitable for all age groups. It can help in organizing home and professional spaces. The machine is excellent for children households where everything from lunchboxes to water bottles, books, folders, racks needs to be labelled. For offices it can help organize filing cabinets, shelves, CD cases, folders etc. The durable tape quality offers excellent labelling for outdoor stuff in gardening, sports, and fun activities. Q. I need to print an ample amount of labels for my business every other day. I have a huge requirement for good quality label tapes that I need for use with my handheld Brother P-Touch H105 labeller. Will Brother P-Touch H105 label tapes be the right choice? A. Yes, by all means we’d recommend these label tapes for your labeller to you. These tapes have very strong adhesive, are made from durable material and can withstand frequent handling too. Q. Can I fix these label tapes to different types of surfaces or do they work on only certain kinds of exteriors? I’ve been using another brand so far, and someone suggested that I try these Brother label tapes. Please advise. A. These label tapes stick to practically every kind of surface so you can use them for various purposes. These label tapes have received positive response from most customers and professionals who use them in different areas of operations. Q. Do Brother P-Touch H105 Label Tapes have laminated surface? Q. Do sellers of Brother label tapes (such as P-Touch H105) assist with buying label tapes at discounted rates? A. Yes, they do. You can look forward to attractive deals and discounts that sellers provide on these label tapes. Q. Are these Brother label tapes feasible for home use? Can I use them outdoors as well where they’d be exposed to varied weather conditions? A. Yes, these label tapes are used widely by people at home besides office. You can use them at your home as well as outdoors. Since they come laminated, they are able to withstand abrasions and scratches; in fact, they are also UV rays resistant and invulnerable to chemicals, oil and sleight. Brother guarantees durability and ease of use of your labelling machine along with these tapes. Q. Are Brother P-Touch H105 Label Tapes available in different colour combinations? Are all the combinations clearly visible? A. Yes, they are available in colour combinations such as black on yellow, black on white and also on clear background. All the options offer maximised visibility and preciseness in printing. Q. I'd like to know whether these label tapes are thick or thin in dimension and whether they will appear professional and not deface the surfaces it’s stuck on? A. These labels are thin but are actually very strong and durable. They lend a sleek, professional look to anything you stick them to, so you can rest assured they won’t spoil the appearance or anything on which you put it on. Q. I need innovative-looking frames to appear on the labels that I print. Does Brother P-Touch H105 Labeller print them? A. Yes, you can add new frames to outline your labels that you print with this machine. You can press the Frame button to do that. Q. Are Brother P-Touch H105 Label Tapes available in both, genuine and compatible versions? A. Yes, these labellers are available in both versions. Q. Is it ok to stick these label tapes to DVDs and CDs without facing the risk of damage to their surface? A. It is perfectly fine to use these label tapes on CSs and DVDs without worrying about damage to them as long as their surface is not damaged. Q. Can I design creative labels with Brother P-Touch H105 Label Tape Labeller? A. Yes, please use Auto Design or Deco Mode functions for which buttons are provided for you to design creative labels. Q. Are these label tapes available in size 9mm? Are these tapes available in a bigger size? A. Yes, the label tapes are available in size 9mm. They are also available in bigger size, i.e. 12mm.